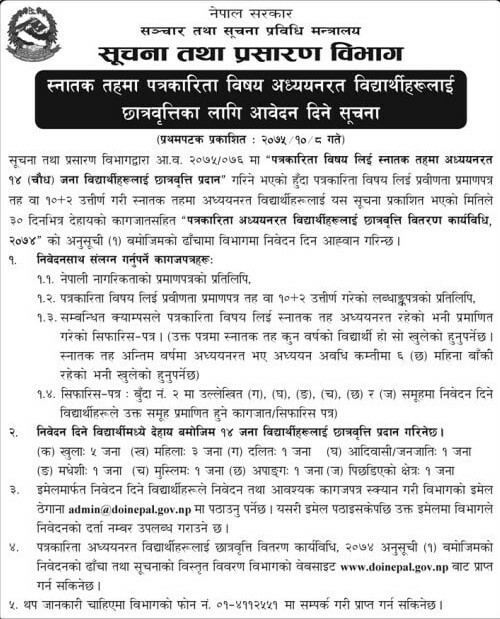 Home / Scholarships / Scholarship Notice from Government of Nepal, Ministry of Communication and Information Technology, Department of Information and Broadcasting. Scholarship Notice from Government of Nepal, Ministry of Communication and Information Technology, Department of Information and Broadcasting. Government of Nepal, Ministry of Communication and Information Technology, Department of Information and Broadcasting published notice regarding scholarship for journalism students to study Journalism in Bachelor Level. Scholarship application deadline: Falgun 08, 2075.